Submitted by RAG on Fri, 12/04/2009 - 13:26. A couple of concrete supports are still around. There are 2 at the bottom of Clark hill and Quigley. I 've heard that no one is sure who owns them. That seems odd. I think that they should be preserved in any case. For more photos follow this link. Submitted by lmcshane on Sat, 02/25/2012 - 07:23. It seems that residents of the city center have especially suffered at the hands of the evil Albert Porter. And, it hasn't stopped since. Taking out the Clark Bridge was the first blow to our community--and it would have been followed up by this highway development were it not for a handful of angry women. Old habits die hard or never die at all in NEO politics. Porter, who was also the county's Democratic Party chairman, was driving a steamroller that not even Republican Gov. James Rhodes could stop. In March 1966, George Condon, a columnist for The Plain Dealer, wrote, "No doubt the Clark Freeway will go precisely where County Engineer Porter [says] it will go and the public be damned. But wouldn't it be nice if ... human values and natural resources took precedence over the arbitrary plans of the engineers?" Yes, answered the "chintzy, spoiled bunch," refusing to roll over. "Better ducks than trucks!" they cried, mounting more public pressure against Porter and his highway men. After a seven-year battle, Porter realized he was outgunned. In 1970, buckling to the growing protest, Rhodes quietly took the freeways off the map. "We had a wonderful party," Barber said. "I remember a great public sigh of relief." Killing the Clark and the Lee also killed tentacles that would have reached through Highland Heights, Richmond Heights, Gates Mills and other Cuyahoga County suburbs. Six years after the battle, The Plain Dealer reported that Porter had created an employee payroll kickback scheme that raised millions of dollars for himself. Submitted by RAG on Sat, 12/05/2009 - 11:43. I'm glad everyone is enjoying the photos and postcards. There are still 2 old concrete bridge support pylons at Quigley and Clark. Submitted by ward14resident on Sat, 12/05/2009 - 17:33. Thanks RAG. My husband was just asking me that question last night. We are both enjoying the photos. Thanks for posting them here. Submitted by Jeff Buster on Sat, 12/05/2009 - 20:02. Iwill go and check out the remaining concrete columns and see if there is anything else left. The bridge would have made a fantastic tourist viewing platform for looking at the Mills. Then again, maybe that's why it's gone. Below is a black and white image from the Cleveland Memory Project showing Clark Avenue Bridge over Independence. 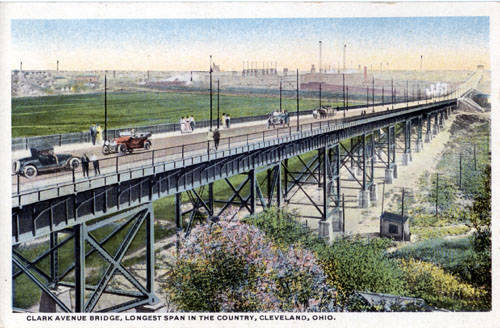 Clark Avenue Bridge was closed in 1980. I like that shot by Independence Rd. Submitted by RAG on Sat, 12/05/2009 - 20:33. We used to drive around down there all the time in the 1980s. We'd follow the flatbed trucks with hot steel on them - still glowing. Eventually we'd get chased out but sometimes we'd be there for hours. How do you get your photo in the comment box? Mine never paste. Submitted by jerleen1 on Sat, 12/05/2009 - 12:26. This is beauty. A definite for a photo frame or a pillow. To look a this photo just only makes one realize how mucked up the world is we live in today. Submitted by skd0333 on Sat, 12/05/2009 - 19:48. Submitted by skd0333 on Sat, 12/05/2009 - 19:49. That's 1889, not 1989. Sorry. Submitted by RAG on Sat, 12/05/2009 - 20:29. Your building history is fun. Submitted by jerleen1 on Sat, 12/05/2009 - 22:01. RAG, I haven't enjoyed anything so much in a long time. I spent an hour or so looking at the old photos. They were so interesting. Maybe others will post some as well. . I found some old pictures a wall in a house that my sister bought on Denison. She was going to throw them away by I wouldn't ler her. I'll have to look through them and see what all I have. Submitted by None on Sun, 12/06/2009 - 23:20.